Big on performance but compact in size, the Garmin TT 15 Mini GPS tracking collar is made to fit smaller dogs. This dog tracking collar offers all of the features of the standard-sized TT 15, packed into a light-weight casing and shorter strap. The newest of Garmin’s track-and-train technology designed especially for smaller dogs, the Garmin Alpha TT 15 Mini offers the same great tracking technology as full-sized dog tracking collars. All in all these Garmin Mini GPS collars are big on performance and features. They have all the features of their full-sized brothers (TT 15 and T5) packed into a small casing for a small dog. The performance was every bit as good as a full size collar. I would not hesitate to put these collars on my full size dogs and go hunt for big game. The Big Game hunters will find one of these collars handy to use on their smaller pups who don’t fit a full size collar. We all know how frustrating it is when those younger dogs start to click while they are too small for a collar. Personally as more of a big game hunter, I was able to get a lot of use with this collar on my 3 month old pup while we spent time in the woods smelling and working on basic training next to the Big hounds. I try to walk in my young pups at every opportunity. I feel it’s really good to have experiences in the woods with me and the older dogs. It has been very comforting having the "peace of mind" that I wouldn’t lose my young pup who was starting to get brave and wander into the forest further and further. Previous to this Mini collar you were always asking "where’s the pup"; so while this collar is a great fit for the Beagles, Terriers, and Feists, I think even the big game guys who consistently have a young prospect on the ground will find it just as useful to have one or two of these mini collars in their bag of gear. I know I do. Designed for dogs 15-50 lbs, the TT 15 Mini track-and-train collar is made to properly fit a wide range of neck sizes, from a tiny 9.5-inch neck to up to 14 inches. 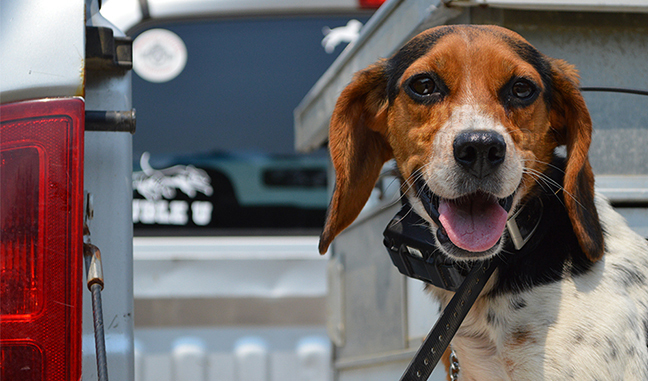 Weighing a mere 7.5 ounces makes this dog tracking collar a winner for the beagle and other small dogs. The shorter-profile collar housing and narrower ¾-inch strap should eliminate sizing issues and leg-banging problems people were having with the standard sizes. When the TT 15 Mini tracking collar is turned to Sleep Mode, it will no longer transmit information back to the handheld unit, thus conserving battery life. However, the collar will still be in connection with satellites. This allows you to immediately start tracking when Sleep Mode it turned off. This is particularly useful while the dogs are in or on the box during travel. Sleep Mode is only available when linked to an Alpha 100. The Garmin TT 15 Mini GPS tracking collar has an on-board Tri-Tronics training system with 18 levels of stimulation. Along with momentary and continuous stimulation, the Garmin TT 15 Mini offers tone and vibrate. The high-sensitivity, top-mounted GPS receiver is able to transmit signals from GLONASS as well as GPS satellites. This doubles the number of satellites to which your TT 15 Mini tracking collar can connect, cutting down on dropping satellite connection when you’re in rugged conditions. The collar also comes with a more durable and flexible stainless-steel cable antenna that measures 18.5 inches. When bark detection is activated on your TT 15 Mini track-and-train collar, you’ll see the rate individual dogs bark. 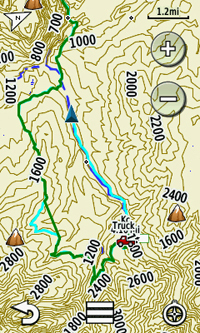 A bark scale can be displayed on both the map and compass screen but can also be set to the compass screen only, reducing clutter on your map screen. You can also set an alert for when your dog barks a minimum bark per minute (20, 40, 60, and 80). This is a handy tool when your dogs are out of hearing range and you are trying to determine whether the dogs are trailing or have the critter jumped or treed. 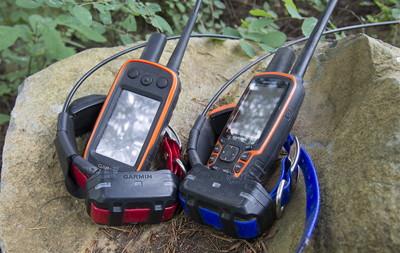 Rescue Mode is the second power saving feature on the Garmin Alpha TT 15 Mini and has become a staple feature with Garmin GPS dog tracking collars. When activated, the dog tracking collar will automatically drop the update rate to 120-second (2-minute) intervals when the battery life falls below 25 percent of a full charge. This allows for additional hours of battery life to hopefully retrieve your dog. When linked to an Alpha 100, the TT 15 Mini tracking collar features codes to allow for tracking and training or tracking only. When you connect your dog to a buddy’s handheld, you’ll be able to give them a code to allow for tracking and training or just tracking. This means you can control who is influencing or training your dogs! When linked to an Astro 320, you’ll have to enter a 4- digit code into the handheld before tracking is enabled. This feature could be very useful to those who hunt in large groups and hunt in competitions. Using the updated Alpha 100 or Astro 320, you can change the status of individual dogs to best reflect what they are doing. Your options are pointing, treeing, auto, and none. This lets your Alpha or Astro know that when your dog is sitting still, he or she could still be on point or have game treed. The power button is located at the bottom of the collar, under the dog’s chin which keeps it from getting damaged. With the TT 15 Mini track-and-train collar, you’ll never have to use zip ties or tape to secure an antenna. The collar comes with a thick, durable rubber cover sleeve that keeps the VHF antenna erect and receiving communication signals. Along with the rest of the collar, it’s extremely durable and easy to clean. Modelled after previous Garmin tracking collars, the collar straps on the Garmin TT 15 Mini easily slide right through the channels on the receiver box, making collar swaps quick and easy. 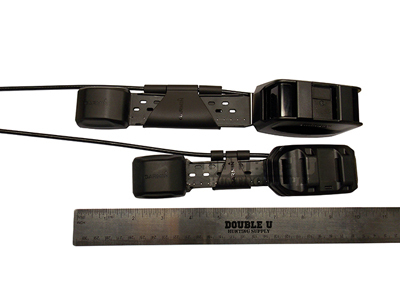 All ¾-inch straps will fit the TT 15 Mini dog tracking collar. 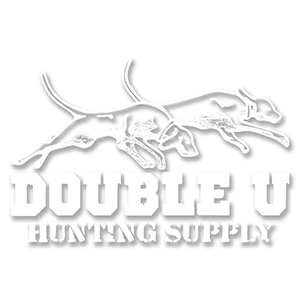 Pick from any one of Double U’s different colors. The charging port on the Garmin TT 15 Mini allows 3 different charging options: AC outlet, a vehicle charging port, and the USB port on a computer. This is especially handy when it’s time to run a software update on your collar; all you have to do is attach the charging clip, plug your TT 15 Mini into your computer, and run the Garmin WebUpdater. 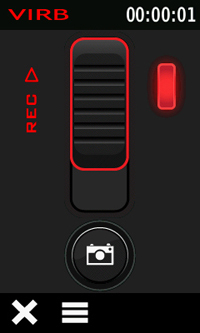 When connected to the Alpha 100, the Garmin TT 15 Mini is capable of controlling the Garmin VIRB camera. NOTE: The Garmin TT 15 Mini is capable of being tracked on both the Astro 320 as well as the Alpha 100, but cannot be tracked on both devices simultaneously. In order to track the TT 15 Mini, be sure to update your Garmin Astro 320 or Alpha 100 for best performance. This can be achieved easily by downloading and running Garmin WebUpdater on your computer or tablet. Get started with the Garmin TT 15 Mini GPS tracking collar today and be on your way with a better-fitting, feature rich device.